After the difficulties we had with the MarsDrop parawing guided descent experiment earlier this spring, we conducted some low altitude testing to learn the best way to pack the parawing for deployment. Following these drop tests, we managed to fly the parawing several times to successful recoveries. Most recently, we flew the MarsDrop payload in tandem with a second payload carrying a 2-way communication experiment on a high altitude balloon. The plan was to cut down the MarsDrop payload around 60,000′ and let the second payload continue to the top altitude, around 100,000′. Although it was partly overcast, the launch was picture-perfect. The MarsDrop separation happened right on time, at an altitude of 64,000′. We noticed a problem with the high altitude payload though when it started coming down early from a peak altitude of only 70,000′. The two recovery teams were both able to track their respective payloads to visual contact while still in the air and recover them successfully. 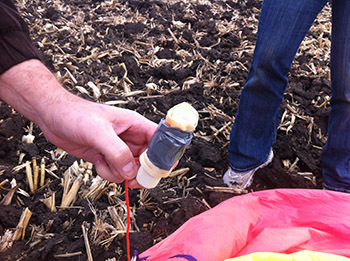 When the high altitude payload was recovered, we found no trace of the balloon. Rather than shards from a burst attached to the parachute, we found it the fill nozzle appeared to have sheared off completely right at the top of the fill tube. The cause remains unknown, but we hypothesize that the shock of releasing the MarsDrop payload caused oscillations in the balloon that were exacerbated by the winds in the tropopause and led to the failure of the balloon nozzle. The MarsDrop itself continued to fly for at least an hour longer than the high altitude payload and was recovered with no problems. That parawing sure does glide! Our next challenge will be actually guiding the parawing to a designated landing zone. Could Buoyant Spacecraft replace rockets for ascent to orbit?